More than 1000 people turned up in Lambourn on Sunday to applaud the victory of Many Clouds success in the Crabbie’s Grand National. Pic: John Grossick ( Courtesy of Great British Racing). 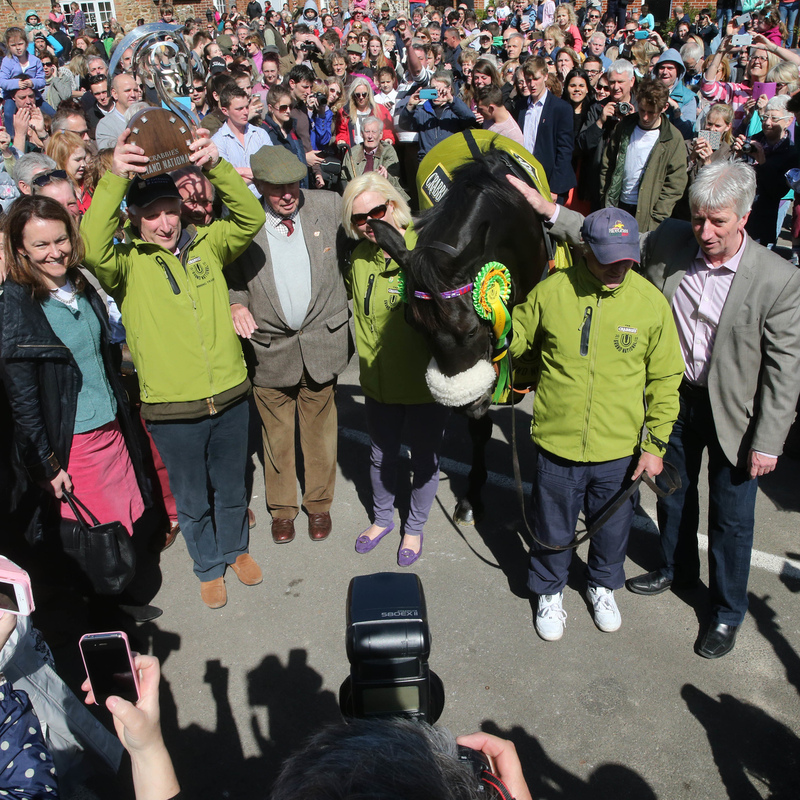 Many Clouds received a hero’s welcome at the Berkshire village of Lambourn on Sunday when over 1000 people turned up to applaud his victory in the Crabbie’s Grand National. The win continued a terrific campaign for the Oliver Sherwood-trained eight-year-old who earlier this season landed the Hennessy Gold Cup and BetBright Cup Chase under jockey Leighton Aspell, before finishing sixth in the Cheltenham Gold Cup. The one and three quarter length victory at Aintree on Saturday was Aspell’s second successive win in the Grand National – following his victory on Pineau De Re last year – and the first for Sherwood who admitted that he felt ‘humbled’ by the occasion. “I was worried about what happened in the Gold Cup so even yesterday I was going in blind because he didn’t run his race then,” Sherwood said at his stables in Lambourn on Sunday. “It was Trevor Hemmings [owner] who persuaded me to run in the Grand National so he deserves a lot of the credit. At Aintree on Saturday Many Clouds raced close to the pace before taking it up five fences from home. He fought well in the closing stages to fend off the late challenge of Saint Are. Monbeg Dude was third, Alvarado fourth and Shutthefrontdoor fifth. “It is wonderful. Many Clouds has given his all and gave me some ride,” Aspell said immediately after the victory in the £1million contest. I asked him some big questions and he has dug really deep. “I tried to conserve energy because he had a hard race in the Gold Cup. It is a wonderful training performance by Oliver to freshen him up and recharge the batteries. “He is all heart and gave me the best ride I have ever had over these fences. He was awesome and I was just hoping the battery life would last. I took every opportunity to save as much battery power as possible. “Because of his ability, we always thought he had a chance but we just weren’t sure whether we had him in top condition as we peaked him twice this year for the Hennessy and the Gold Cup and we weren’t sure whether we’d overcooked him. Now he’s maturing, he trains well and eats well and finishes his races well. Many Clouds’ success was the third in the Grand National for owner Trevor Hemmings, following the victories of Hedgehunter (2005) and Ballabriggs (2011). “It was incredible,” Hemmings said at Aintree. “I always dreamt, as one would, of winning the Grand National and then we won it. Then we won it for a second time and it was something special, but now the third one comes along, I just can’t believe it. It is an amazing feeling. “Noel le Mare won the Grand National three times with the same horse [Red Rum] and we have done it with three different horses.